Have you ever imagined swimming in a clear mountain lake…. that is littered with human bones and skulls? Perhaps not everyone’s dream holiday! Around 75 years ago, this was the scene discovered by a ranger in a remote heights of the Himalayas, at an elevation of 15,750 feet. The mountain ranger, H. K. Madhawl, probably didn’t consider taking a swim in the ice-cold waters. 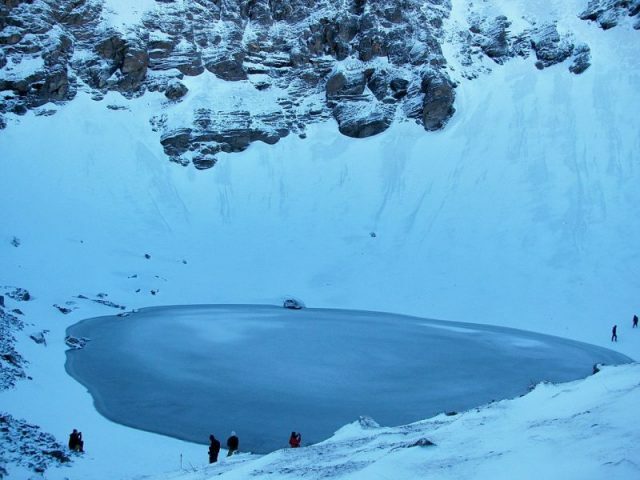 Roopkund Lake, in the state of Uttarakhand, India, is a six-foot-deep glacial lake that remains frozen for most of the year round. The remains of roughly 300 people were subsequently removed from the lake. A number of these victims of the mountain were so well preserved that they still had remnants of flesh, hair, fingernails, and clothes. Jewelry and other artifacts have been found over the years. 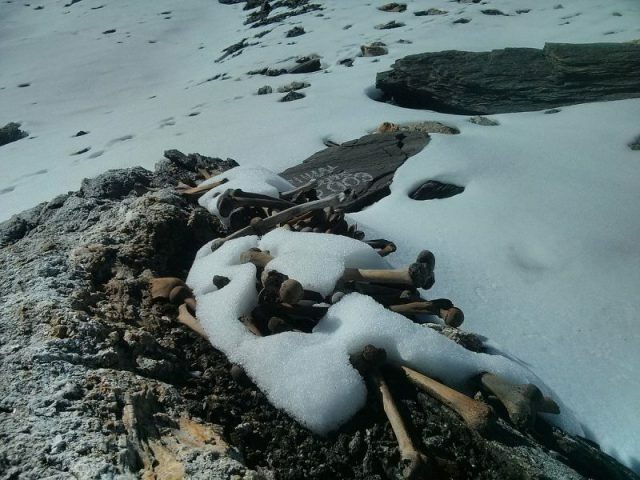 It is because of this odd mass grave that Roopkund is also known as the Skeleton Lake. However, the lake’s contents stir a striking contrast with the scenic beauty of the mountainous region. 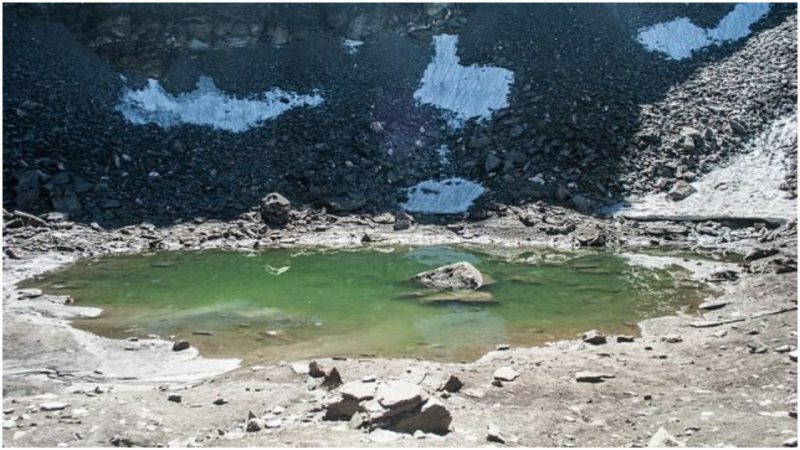 The surreal sight of human remains deposited on the margins of the lake is visible only when the snow and the ice melt. 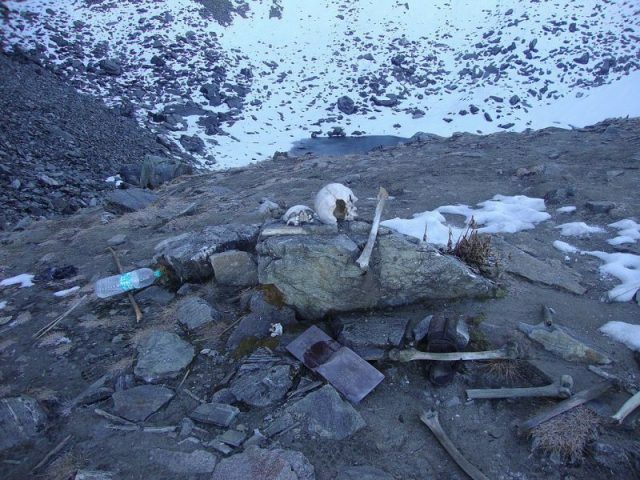 Besides the skeletons, the melting ice has also revealed personal belongings such as knives, spears, and leather shoes. The area is a well-noted destination among global trekkers. 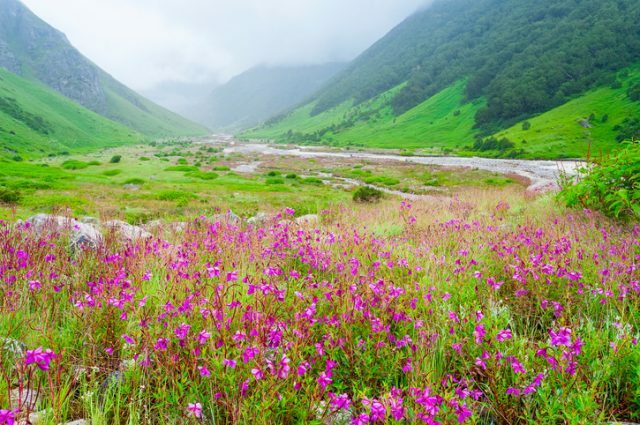 But to reach the place, it takes a real effort to progress through the steep route that ascends from the village of Lohajung (7,700 feet) — a five day trek through thick forest, lush meadows, and up into the alpine landscape. 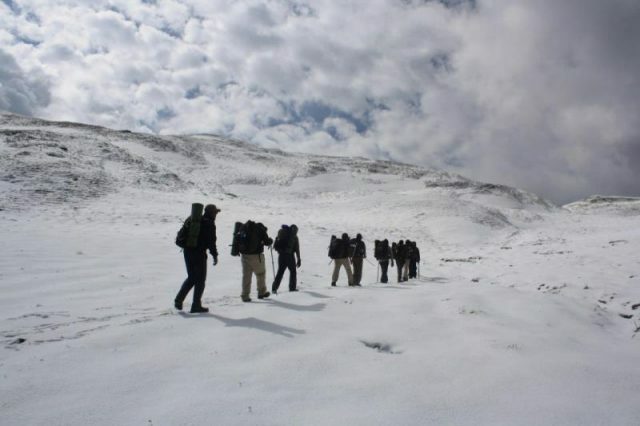 The popular trek tours run only in May-Jane and September-October, when this section of the Garhwal Himalayas is accessible. Once every 12 years, trekkers will find themselves joined by thousands of devotees to the Goddess Nanda Devi who are undertaking an arduous 22-day barefoot pilgrimage to the Sri Yantra (breath of divinity) at Nauti village. 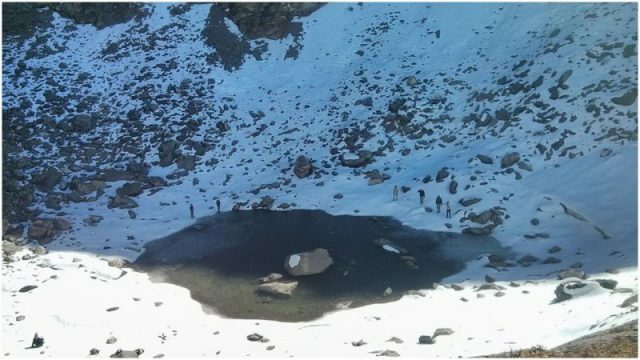 The gruesome discovery of Roopkund Lake’s bones is credited to H. K. Madhawl, a ranger at the Nanda Devi national park who traversed the area in 1942. But the area has featured in local folklore stories for decades. What he saw up there confused everyone. At first, it was one bone. But as the temperatures warmed more and more, the number of exposed remains steadily grew. People wondered what happened, and what were these people doing up here? The initial assumption was that these were the remains of a group of Japanese soldiers. Since it was the midst of WW2, such an explanation sounded logical enough, but the bones appeared too old. Other theories were proposed throughout the years, even people wondering if this was perhaps a ritual suicide. Others suggested the deaths may have been caused by a natural catastrophic event. Perhaps a landslide or avalanche? A more concrete explanation had to wait for another six decades, enough time for people to start believing the local legends about how the skeletons came to be there. As the legend goes, these are the holy lands of the Goddess Nanda, her sanctuary in the mountains. King Jasdal of Kanauj and his wife were undertaking the “Nanda Jat” pilgrimage; along the way, the queen gave birth. Instead of pleasing their goddess with their tributes, the deity was angered for this defielment of her pure mountain. To punish the group, she sent a great snowstorm, flinging iron-like hailstones that took the life of each and every person. A more advanced scientific effort was carried out in 2004, and the answer, eerily enough, was not too far from what the legend says. It was found that injuries to the skulls and shoulder bones of the skeletons were consistent with the victims being hit from above. Traces of round-shaped blows and cracks were found on the bones. Presumably, it was “iron-like” hailstones, just as the legend tells. The 2004 expedition also took samples of the bones as well as bits of preserved human tissues. DNA analysis was supported by the Hyderabad’s Center for Cellular and Molecular Biology in India, and the research team included several European scientists. According to the conclusions of their study, there were two distinct groups of people, as there were evident differences in the bone features of their bodies. All remains were dated to the ninth century AD. The plausible scenario of what exactly happened? The two groups perhaps met at the foot of the mountain. The first of the two, taller and who which outnumbered the others, probably wanted to make a pilgrimage pass through the mountain. The second group, with thinner and smaller bones, showed up as their local guides. The travelers were related to each other (a large family or tribe), and could have come from Iran. The locals that guided the way were unrelated. Another suggestion is that they braved the elements to collect “Keeda Jadi,” which are larvae of the ghost moth that have become the home to a fungus (that actually wraps around the larvae and slowly devours it). These “Magical Mushrooms” are believed to have incredible medicinal properties and locals head out in search of them in the springtime. The journey should have progressed well until the point everyone was trapped, with no place to run and hide as a disaster struck. A violent torrent of baseball-sized hailstones falling from the skies battered the whole group. 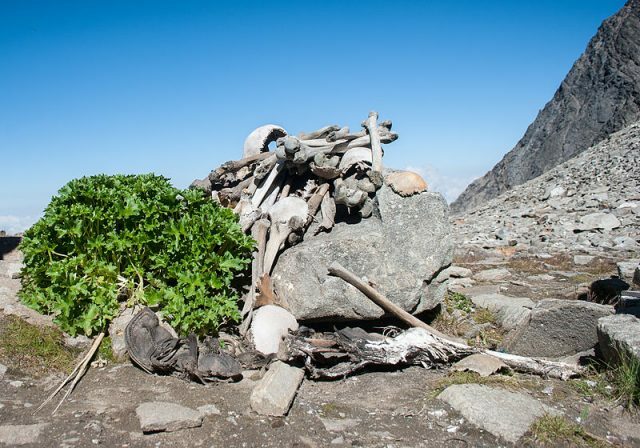 Trekkers who come to the lake can still see the remains of this ancient group, though the number of visible skeletons has over time been reduced. It is said people take some of the bones as a souvenir. Government officials have considered preserving the site from further desecration by travelers, to ensure the age-old remains are left as they are.